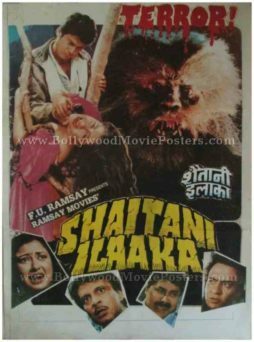 Hindi horror movie poster for sale of the old Bollywood horror film, Shaitani Ilaaka (1990). This is an actual surviving Hindi horror movies poster of the 1990 Bollywood horror film directed by Kiran Ramsay that starred Deepak Parashar, Kanwaljit Singh, Satish Shah and Ranjeet in pivotal roles. Kiran Ramsay is a part of the Ramsay Brothers group (who are considered as the kings of Bollywood horror). Printed and circulated during the initial release run of the film (somewhere in the early 1990s), this Hindi horror movies poster was designed for publicity of the film but never ended up being used. This Hindi horror movies poster was originally designed on a canvas board by arranging still photographs from the film in a collage fashion. The murdering ghoul is seen on the top right hand side of this Hindi horror movie poster. Faces of the lead characters from the film are seen in a brilliant photographic collage at the bottom. The title of the film appears in radiant yellow on the bottom of this Hindi horror movie poster for sale. The word “Terror!” is seen in blood dripping red on the top of the poster. Old Bollywood horror movie poster of one of the scariest Hindi horror films ever made, Purani Haveli (1989) for sale. This is an actual surviving publicity poster of the 1989 classic Bollywood horror movie made by the undisputed kings of Bollywood horror, the Ramsay brothers. Printed and circulated a few years after the first release of the film (somewhere in the early 1990s), this Hindi horror movie poster was printed for publicity of the film but never ended up being used. This poster was originally designed by cutting out images of actors from separate still photographs (shot on set location) and pasting them on a board. The background and typography are hand drawn / hand painted, which makes this horror movie poster an interesting mix of two very different design techniques. This Bollywood horror movie poster features still photos of lead actors Deepak Parashar & Amita Nangia on the left, with the scary demon appearing on the right. Purani Haveli is a 1989 classic Bollywood horror movie made by the kings of horror in India, the Ramsay brothers. It is widely regarded as one of the scariest vintage Bollywood movies ever made in Indian cinema.